I ordered a used copy from Amazon for $10 including shipping. How about we aim for end of June to begin reading? If you’re interested, order the book and we can figure out a plan near the end of June. We can discuss it online as we read through it and maybe meet up at the end? Entry filed under: Uncategorized. 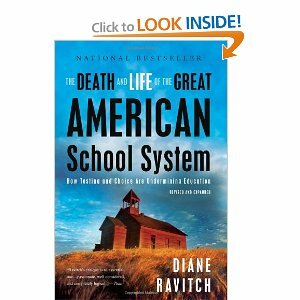 Tags: cps book club, death of the great american school system, diane ravitch book. I am so excited! I hope this will be a lot of fun. I’m getting my copy today. Sounds gr8! Love a book club. I’ll get mine today as well. I may have to take you up on this! I have a copy on hold in the library right now – I’ll pick it up as late as possible into the process and maybe make notes if I have to read ahead or be without it for a bit. My book will be here Wednesday. I had to pay a little bit more, but I like to support the neighborhood bookstore (ma & pa shop). Is it too early to plan the get-together at the end? wonderful choice! i just went searching in it today for a great passage about the inherent value of neighborhood public schools in a democratic society. (end of ch 10!) the library needs to pick this book for ‘one book, one chicago’! Great idea! I just put it on hold at my library – should be here within a week or so. I’m in as well. Great choice for the first book- I got it on my Kindle. Great idea. I’ll make sure Gayfair Dad gets a copy, too. Should I mail one to Rahm and ask him to join the book club? Just ordered on Amazon. Did you ever here that awesome interview she did with Terri Gross on NPR prob around the time this book came out?? I got a strange robo-call saturday from I think CPS, it was chopped up and garbled. Didn’t think much of it until I heard others complaining about it. For future book club consideration: A People’s History of the United States by Howard Zinn. I’m in too. Yes, think we should pick a date for in-person meetup and discussion! June 28th? Ok, great – I’m excited we have a good sized group on board. So I haven’t done a book club in years. Should we set a target date for a few chapters, then meet to discuss? And/or keep an online discussion going? Btw, I love that Diane Ravitch is 73 year old and has had late-found fame. Very cool. She also donated all the speaking fees from her book to a charitable organization in honor of a son she lost as a toddler to leukemia. I’m in, too. I started it a few weeks ago. My book just came and I can’t wait to start reading (tonight)! Where do you anticipate meeting? Mayfair Dad, I’d have never guessed you’d push Zinn’s book! great second choice. Love the book-club idea! For your consideration: Peg Tyre’s The Good School. 1/2 way through the book…not usually such a slow reader, but I’m running the kids all over the place! Definitely recommend this. Especially the section on standardized test scores. Shoo. I recommend reading Federal IDEA 2004 (sped) law. Find out why the US decided to educated disabled people. Have started The Overachievers. Poor kids! I’m in. Looking forward to a lively discussion. I found the description in the initial part of the book about the fight on national standards for history to be so fascinating. I realized that there will basically be disagreement about any random educational topic. Who knew there could be so much debate about what history to teach? I love the new/multi-racial/gender inclusive vs. traditional (old white guy) argument. Now THAT would have been a very interesting debate to participate in! The story about attempts to make improvements in NYC and San Diego are also fascinating. northside or anyside is fine for me as longe as I’m in town! Got it on Kindle. Also I’ve already read The Good School so that would be my vote for the next selection. How Billy Beane used objective mathematical models to measure performance in ways that old-guard baseball “experts” said could not be done. In doing so, found value in previously disrespected players, leading to a high-performing team that could compete with teams spending 3 times as much money on payrolls. A cornerstone of Beane’s approach was to use on-base percentage (hits plus walks) instead of batting average (hits). Old-timers tried to discredit this approach by saying that it measured factors that were out the hitter’s control (walks were a function of pitching, not hitting — and batters cannot control pitching they argued). Today, every major league team has a department devoted to sabermetrics, a statistical approach championed by Bean and other baseball deformers. I am looking forward to discussing this book. Great idea! I’ve got an autographed copy I’m willing to auction off…. @Karen Lewis, why would you want to auction that off? Isn’t that your copy you annotated and post-it flagged? @cpsobsessed. When you have the date set, let me know and I will share on RYH site. I announced it at our last townhall forum and people thought it was a great idea! I’ve already read the book and would like to join the group. Keep me posted. “Jim Stergios’ Boston Globe post on the question of a longer school day in relation to academic performance was well worth reading and I am glad Alexander posted a link to it. It provided some national and international information that was of value. But as is common in relation to this discussion on the length of the school day the elephant in the room not discussed is the social economic performance outcomes in societies. Frankly, I am just plain tired of reading about Finland’s educational performance relative to a school district like CPS. But since this can of worms is opened yet again on this blog let discuss it. “According to the Organization for Economic Development (OECD) Finland has only a 4.4 percent child poverty rate whereas the US as a whole has a child poverty rate of 22.4 percent. It goes without saying that the child poverty rate in CPS is around 86%. In lower income households, which in Chicago also correlate with a lower educational level of parents, children’s linguistic interaction with adults is significantly less complex than it is for higher income children. The issue of increasing reading and math time to offset the deficits of families in poverty has been studied and at scale. Its effects are limited for poorer children, one 1986 study that appeared in the Economics of Education Review found on a cost benefit basis it was not worth it because the impact of a longer day had its limits [see http://www.sciencedirect.com/science/article/pii/027277578690052X%5D. “There is probably no evidence that a longer day hurts poor students, at least none I saw. But given the general fiscal crisis we are facing in Illinois and in Chicago there is little evidence that we should right now be spending anything at all on a longer school day. But here in Chicago this issue is not up for debate, because it has been decided politically due to Mayoral control of CPS. “The responsibility for the insertion of the longer day into the Mayor’s campaign platform really lies with Stand for Children, Advance Illinois, and the Civic Committee of the Commercial Club of Chicago which pressed Mr. Emanuel on this issue. Over and over again we heard the story of how much better students attending Houston Public Schools had it than CPS students did because of Houston’s much longer school day. Never once did these proponents of the longer day disclose that wealthy and middle class parents in Houston overwhelmingly chose to send their children to one of the seventy-nine Houston Area Independent Schools, unless they can get into Houston’s gifted programs. “One example of an excellent private shool is the Kinkaid School in Houston which enrolls about 1,300 students in grades pre-kindergarten through twelve. Kinkaid has over 363,000 square feet of facilities, half of which is new since 2001. In grades 9-12 the tuition is $20,530, just over $16,00 for kindergarten. In fact if you look at the size of the Houston Public Schools including charter schools, which about one half the size of CPS, you realize proportionally Houston as a city has more students attending private schools than does Chicago. “From 1999 to 2009 the number of white students attending public school in the larger Houston metropolitan area declined by about 18%. In the Houston ISD there are only 8.1% white students left and just from 2007 to 2011 the school district lost 2.1% of its white enrollment. More than 26% of Houston students in gifted and talented programs are white. About 43.8% of all the remaining white students left in Houston are in gifted and talented programs. Isn’t it odd that those advising the Mayor didn’t tell him about that? Apparently the Houston longer school day has not really done much to draw in non-minoirty parents and if they don’t think it is much of a draw how much value does it really have? Say, Junior. Wasn’t Ron Huberman our money ball guy, what with his performance management and levers for change? I got my copy and thought I’d read a few pages to see what’s what. I’m half done. This is fascinating for a lot of reasons. The author uses idealized language, and definately has a position, and there’s no confusion which side, but manages to present both sides of the issues in detail. Those on your site interested in the selective enrollment process, which appears to be a majority, are probably not in favor of her overall postion on school choice. Are you going to put a few threads out there for ongoing discussion? I would suggest a polite thread, and a fist-a-cuffs tread, based on what I read so far. Sorry, I’ve been out of town for several days. I’m about halfway through and am really enjoying the book. I really like her even-keeled writing style. I though the chapter on charters was exceptional, (perhaps because I agree with her?) I liked the way she explained range of success among different charters, building to the speculation of how a tipping point of too many charter schools will affect neighborhood schools. I thought it was very logically laid out and she certainly didn’t come across as totally anti-charter. I didn’t find the test score chapter quite as air-tight (again, maybe because I don’t agree with everything she says.) But she makes a very good case in everything she presents. Actually, from the few blog posts of hers that I’ve read, I think she may come across with a stronger point of view (or bias) but the book doesn’t read that way in my opinion. Feel free to post any thoughts or excerpts to discuss. I’ve also been marking some pages with interesting passages that we can discuss in person. I’ll look at the calendar for a possible meeting date. Perhaps Sunday evening July 15th? I think that the posters on Diane Ravich’s website have it exactly right when they note that school choice erodes democracy. I agree with Ravich’s assessment of the mechanism and cause and effect, but I do not agree with her conclusions. It is unethical for both parent and child to force a child to stay in an underperforming school. The end does not justify the means. The parent with a solvable problem should not be penalized by society’s unsolvable problem. Also, what Ravich doesn’t point out is that the “experiement” did not help the public schools because of the consistent circle-the-wagons mentality of the teacher’s union. #54~I think the “experiment” didn’t work bc of corporate greed, less teachers~more money in pockets. I’m sick of experiments at CPS. So many things ‘work’ but they don’t look to replicate them, only fix what they deem ‘broken’ cheapest way. I see a lot of CPS in this book. @55 I will acknowledge your point, but also mention that I am a Cubs fan. #56~norwoodic “I am a Cubs fan.”~on that note we’ll have to agree to disagree! @57 — this is the most funny statement I have ever heard you make. . . . Ah, if only humor could get us all to get along…. I can not wait to meet you all. WI was shocked when I read where Ravitch talks about history teachers in Texas afraid to teach certain things because of fear of the school board. I am used to hearing about conflicts in teaching evolution or global warming but historic facts???? I just heard of this study: School Reform, Corporate Style: Chicago, 1880-2000, by Dorothy Shipps Has anyone seen it or read it in full? So, has a time & place been decided on to meet up? Can’t wait to discuss it! ??? – you never told me you were a teacher. I kid because I care 🙂 Please schedule the shindig for after 6:00 PM for us unlucky chumbalones who work all summer. I finished the book as well and can’t wait for the discussion! Can we do it on line? In case there are those who can’t make it? Glad to see that people are ready to discuss. My overall impression of the book was that Ravitch is trying to justify the position of the teachers union, which is to block any attempt to fix the problem and then just complain about the efforts of others. Then I sat down with my father-in-law who taught HS English his whole life, and my neighbor who teaches at Lakeview HS. After providing the teacher’s point of view – not the teacher’s union – my neighbor pointed out all of the things that teachers and school administrators are doing in Chicago to improve education. My neighbor concluded with her take on the problem in business terms that I can understand – “The teacher’s union needs better marketing”. Some of what she said was very eye opening and surprising, but I’ll save it until others have a chance to share. It’s a shame little of this found its way into the book. To say that competition is not working is not correct given all of the efforts within the public school – many of them succeeding. I think that was the direct intent of competition. The question is would these dramatic changes (like Senn) have happened in the absence of competition? I think some, but not many. @ #66 norwoodic, Wow, I am surprised at your take that the book was justification for unions. Yes there is a pro union theme but I think the reasons that she highlighted a need for teacher unions says a lot. The Texan teachers for example. Or how the most successful US school system is all union and the Finland system is all union. I am a teacher and I do feel that teachers, administrations and yes even CPS has been trying to do better. I also think that CPS needs to stop with it’s merry go round of here is another “new” initiative that is replacing the one before that was only given a year or two. Or the pile up of must do’s that bog a school down and keep it from actually focusing on students. @68 I am not against unions or the teachers uniton. What I am saying is a) that the teachers union at the leadership level has fought all reforms as a threat to themselves, as outlined in this book, b) this book presents arguments against the reform (charters, choice, etc) and shows how bad it is, c) the author mentions her friendship with 3 teachers union presidents and therefore d) I draw the conclusion that this book is the voice of the teachers union leadership and biased. I am not against the union, or any union, but I am not a big fan of the union leadership. I hope that clarifies things. Although that looks a bit complicated. I think the teachers are in the process of driving a revolution in education, and none of that made it into this book. That’s a pretty omission. I also agree with the rest of your statements. But the conclusion that I am drawing is the opposite of the conclusion of the book. Choice and competition are driving change, although it is pretty messy and a lot of people are getting hurt by it. @Norwoodic,Thanks for the feedback. Yes change is hurtful at times. Isn’t there a quote about democracy being messy and hard? Change is too, but it beats the alternative of stagnating and not meeting the needs of my students. It will be great to talk more at the discussion. They have a big, quiet back room where we can meet. There is usully parking in front of Sultzer library at that time, or on side streets. Please let me know here if you think you’ll make it. I’ll have some discussion topics ready, but feel free to bring your favorite topics/questions/etc to discuss. 1 RSVP. Thanks for doing. I bet a lot of ppl haven’t seen this since on the right hand side all the comments are for the budget so this thread may not be showing the updates. I’m sorry, vaca starts on the 29th! I hope you all have a gr8 time, interesting convos and a glass (or many) of wine! I plan to go. Looking forward to it!